Remember my mom and step-dad's house that I shared a few months back? They've been slowly adding their personal style to the place through careful shopping and as many DIY projects as they can to save money on furnishings. They like to curate their home by picking up furniture projects, sewing custom draperies, and finding bargains that they can make over. While many rooms are partially done, there are still many things that they are on the look-out for and some weekend projects still to go. My mom's favorite color has always been red and when they were designing the exterior of the house, she had her heart set on a gray house with a red door and black shutters and that's what she got! Working with a craftsman-style house plan, they tried to inject as much farmhouse style that they could as well. Of course, my mom accessorized the porch with lots of red, potted flowers, and vintage accessories. From a $10 DIY checkers game table, $30 Home Goods rug, $15 yard sale chairs that were sprayed red, to Jon's (my step-dad) handmade birdhouses, I think they've done a beautiful job making a welcoming front porch without spending a lot! A vintage iron plant stand holds vintage garden accessories and some of Jon's creations and my mom frequently sews her own pillows, including the red-flowered outdoor cushion. Lighting: Millennium Lighting through Lights Unlimited Inc. I love their beautiful porch. Red is always good in my book. So many nice and personal touches. I am so happy to see your parents' home!...A former home of mine in Florida had the very same color scheme..gray walls, red door, and black shutters...I knew I just loved her taste in design!! 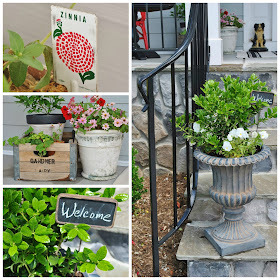 !..the porch is gorgeous..so many beautiful vintage items that have been so lovingly displayed...love those peanut baskets..I need to do something with my "from the Lowes garden center to the porch" plants! !..Looking forward to seeing more of their amazing home and projects! What a beautiful and welcoming front porch (and home) your parents have, Kristen. (I really enjoyed meeting your Mom at the SBC last summer.) The splashes of red are so pretty bouncing off of the gray and black! I'd sit out here all of the time! Love it! What great memories for your children! oh i love it!!!! so happy and american! love those light fixtures! Wow, I love the porch - it looks terrific. I love the colors they picked which red is my favorite. Can hardly wait to see the rest. I have the same dog stand. My love of dogs are the Border Collies and I have one - Waldo and he is the love of my life - my garden buddy and he follows me everywhere I go. That might be the best porch ever! I love the touches of red. It's so neat that they enjoy collecting things as they go along. That gives it more personality. Wow!! Love the red. It really makes a statement! Their porch is so inviting can't wait to see the inside. Wow, talk about curb appeal, Kristen! Such a pretty and welcoming exterior. I love the red and the stone on the house. 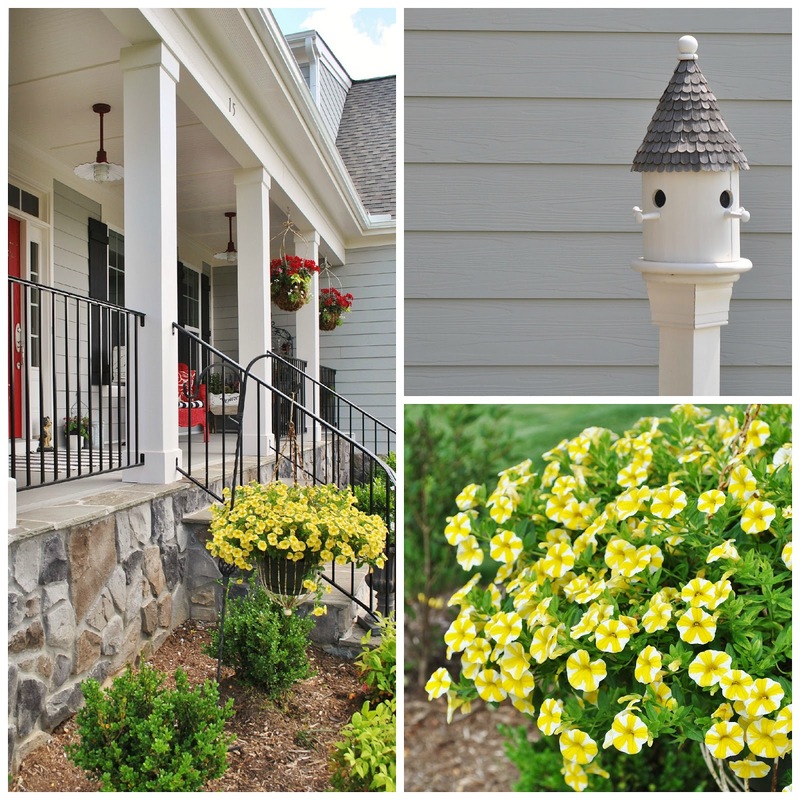 Your mother and her husband have a fantastic eye for design and color, as well as gardening and accessorizing. I had to scroll through the pictures twice! And yes, that light fixture is awesome! I love the porch and I think the best thing about it is the wrought iron railings that go with the shutters and keep it open looking. Can't wait to see some of the inside! Thanks, Kristen! I love the colors your mom used and those lights are fantastic! Fab eye for design, I loved the color scheme used here. Stunning! I love crisp white with red and black. This is just so lovely! I really like the pops of red and the farmhouse style lights in the porch. This is so ME!!! I love it!!!!!!!! It has all the classic styling that I love so much! We recently had our Colonial-style home's colors changed from the original brown-on-brown tones to classic white with black shutters and a red door. (I've not yet posted it on my blog, but an upcoming tablescape will reveal the new color scheme.) Looking at this, however, I'm really considering a pale gray for the next go-round! It's a beautiful combination! 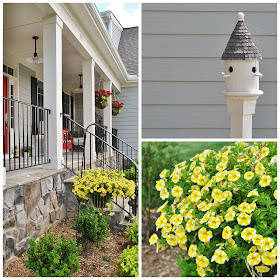 I love all the little details on and around the front porch. It has a SUPER welcoming look!!! I would be drawn to just come up and sit a spell...as a passerby!!! It's really terrific! We don't have a porch, but this would be my inspiration for decorating if we did! I love the extra little touches like the old milk crate (what a great back story! ), the old radio, and the border collie. That game table is outta sight!!!!!!!! For just $10 and the cost of paint! Good luck to your Mom & stepdad as they continue to work on filling out their new home! It's looking A-1 so far!!! Your Mom has great style! 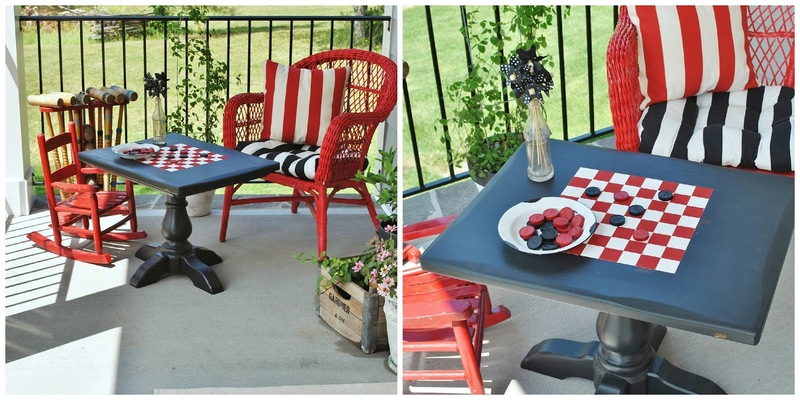 Love the homey feel of the porch with the fun pops of red. Top to bottom gorgeous! Every detail is so sweet. What a beautiful home, and that porch is just perfect. I love all the touches your mom has done, and the lighting has to be my favorite part. Beautiful!! I love all of the red, especially the door and those lights are AWESOME!!! Kristen - Your mom's porch is simply stunning! I love every single thing that she's done. It's easy to see where you get your talent from! Just beautiful! Thank you for joining Home Sweet Home. What a cheerful and lovely home your parents have! I am exhausted after a 13 hour day at school and would love to be sitting on that porch right now. That is such a fabulous home I can see them coming home happy all of the time. The red is so cheery. They have done a wonderful job. I love the touches of read all over and especially those gorgeous lights. Does your mother keep changing the flowers hanging on the front door? I love the look of the mason jar hanging there. What an adorable house! I love her front door. Can you find out the brand and color name of the red they used? I've wanted to paint my back door red but have not found the right color. Their house is charming and they are doing a great job with it. 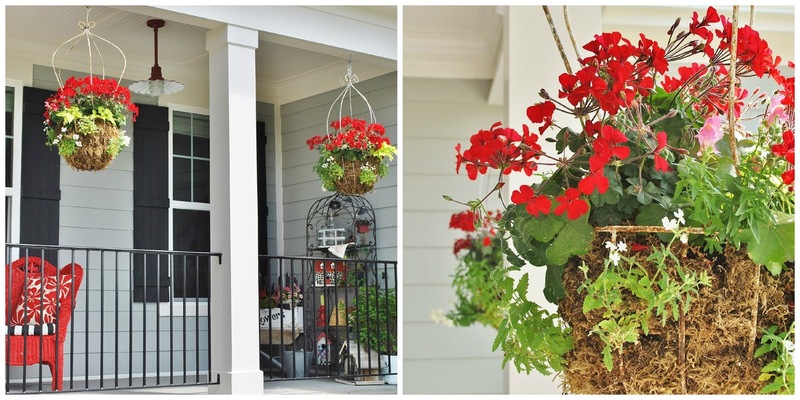 Your mom's front porch is gorgeous and I love the pops of red too!!! Your front porch is beautiful! I think I would be visiting my mom more often if we could sit out and enjoy a porch like that!! It may be one of the cutest porches I have seen. Great Job! Charming! Love the black and white with a pop of red. Happy to find your blog. Do you know Many @ Breath of Fresh Air? She used to have a booth at SuzAnna's. So much charm on the front porch! Love the lights and all the red accents. Don't blame your kids for wanting to hang out there. This porch is soo cute! Love the stone with the pops of red, and those light fixtures!! Sweet details too . . . my favorite is the scrabble tile welcome! oh my gosh, how gorgeous! I love the porch/exterior color scheme and that red door pops! what a space! Your mom's home is just such a wonderful place. love that great front porch, and oh wow, the red is fabulous. I'm going to feature this post on Be Inspired tomorrow. thanks for sharing it Kristen! Charming porch. I love pops of red, too. I think it may have something to do with being married to a firefighter (retired now) for 32 years. I love the front porch and all the red accents! It looks great. Love the front door!! We are currently building our home and are curious if you know what brand the door is? We are having a hard time finding that door style. If you could help it would be greatly appreciated. Thanks! Thank you so much for stopping by and leaving me a sweet comment! I read each and every one of them and they brighten my day!